Audi’s high-tech reinvention of its luxury sedan range continues, with the 2019 Audi A6 the latest to break cover. 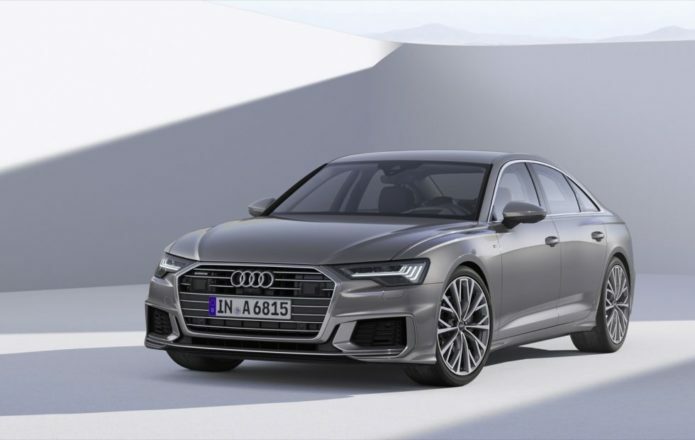 Making its official debut at the Geneva Motor Show 2018 next week, the new A6 brings the German automaker’s full-size sedan into its eighth generation, borrowing gadgetry from the larger and more expensive 2019 Audi A8. From the outside, the shared DNA with the A8 is clear. The grille has grown, and the crease-lines sharpened; it’s a half-inch wider than before, and slightly longer and lower. Audi says the car is also more slippery through the air, too, with a drag coefficient of just 0.24. That doesn’t just help with economy, but how much road noise makes it through to the cabin, too. The body shell is a mixture of steel and aluminum, focusing on both a reduction in weight and an increase in rigidity. It’s also more spacious inside, with more head, leg, and shoulder room in the rear, and a broader trunk that can now handle two golf bags horizontally, even though its 18.7 cu-ft capacity is unchanged. Despite all that, Audi promises a more engaging drive versus the old A6. Standard progressive steering tightens up as the steering angle increases, while there’s dynamic all-wheel steering too that allows both the front and rear wheels to turn. At low speeds, the rear wheels turn in the opposite direction to the front, tightening up the turning circle; at high speeds, meanwhile, they turn in the same direction, optimizing stability during lane-change maneuverers. Four suspension systems will be offered, kicking off with conventional steel springs. Then there’ll be sport suspension, suspension with damper control, and then finally the most expensive adaptive air suspension with controlled damping. Audi’s quattro all-wheel drive will be standard, along with two transmissions depending on engine: either an eight-speed tiptronic that adds a self-locking center differential to the AWD, or a seven-speed S ironic that has Audi’s newer ultra technology for swifter activation of the rear wheels. Two engines have been announced to begin with, though only one of the pair is likely to make it to the US. Europe will get both a 3.0-liter TFSI turbocharged V6 gas engine with 340 HP and 369 lb-ft. of torque, and a 3.0-liter TDI diesel with 286 HP and 457 lb-ft. It’s likely that North American drivers will only get the gas model. Both engines use 48V mild-hybrid systems that allow the car to coast with the ICE off between around 34 and 99 mph, as well as handling the start-stop feature. Inside, the A8 influences continue. The new A6 is marked by long, unbroken horizontal lines that maximize the sense of cabin space. All-new seats can optionally be had with ventilation and massage, and there’s an ionizer and pollutant filter for the HVAC system that can also be had with two fragrances. An optional panoramic glass sunroof is also available, as is a heated windshield. The dashboard gets the twin displays we’ve seen Audi use in the A8, with a top 10.1-inch MMI touch response display and a lower 8.6-inch touchscreen that together handle HVAC, multimedia, navigation, and communications. A head-up display is optional, as is a 12.3-inch Virtual Cockpit display included in the MMI navigation plus package. Natural language voice recognition uses a combination of local and cloud-based processing, so that it can respond even if the 2019 A6 doesn’t have a data connection. Car-to-X intercommunication uses other networked Audi vehicles to deliver traffic and hazard information. Shortly after the new A6 launches, Audi will add an on-street parking service, too. The new Audi connect key can optionally replace the regular key, and allow the car to be unlocked with an Android smartphone. Bang & Olufsen audio is another option. As for driver-assistance, Park assist will give the A6 the ability to navigate itself into a parking space or garage, even if the driver isn’t behind the wheel. There’s crossing assistance and adaptive cruise control which can keep the A6 in lane. Audi will outfit the car with as many as five radar sensors, five cameras, twelve ultrasonic sensors, and a laser scanner, depending on configuration. Sales of the 2019 Audi A6 are expected to kick off in Germany come June 2018. Pricing has not been confirmed at this stage, nor when exactly we might expect to see the new sedan hit US shores.